After SRK, Salman- Hrithik on NDTV, who’s next? Bollywood men seems to be loving TV like their on-screen heroines. With loads money on offer they are leaving romancing babes in movies and getting hooked to TV couch potatoes. 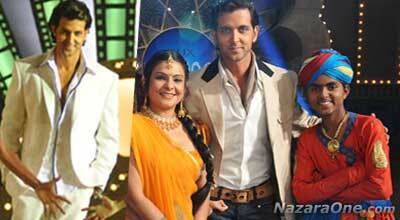 Hrithik Roshan is latest to join TV. After Shahrukh Khan onÂ Paanchvi Pass, Salman Khan on Dus Ka Dum, its Hrithik on NDTV Imagine’s Junoonâ€¦ Kuchh Kar Dikhaane Ka. He wont be a performer, host or judge – he will be goodwill ambassador. Goodwill ambassador – What the hell is that? Another fancy name to justify presence of super star on a TV show. Mind you… get ready to see lot of Hrithik in promos of show ‘Junoon’. AND don’t be surprise if Hrithik’s show appearance is as long as his appearance in ads for the show. Throw truck loads of money he will perform, host and judge the show for you…. right Hrithik?